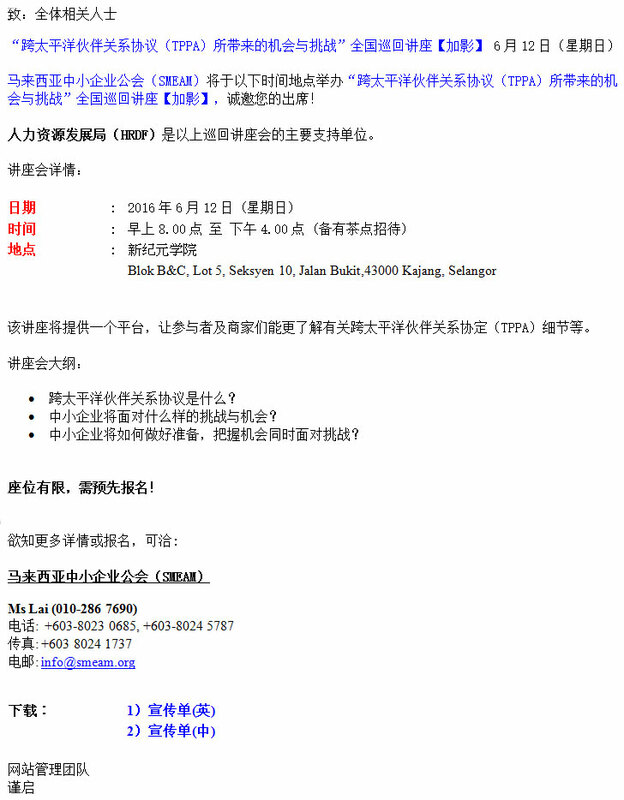 Please be informed that SME Association of Malaysia (SMEAM) would like to invite you to participate in the nationwide seminar on “Get Ready for the Opportunities & Challenges of Trans-Pacific Partnership Agreement (TPPA)” on 12th June 2016 (Sunday) at New Era University College, Kajang. This event is supported by Human Resources Development Fund (HRDF). The objective of this event is to provide a clear explanation on the Trans-Pacific Partnership Agreement (TPPA) to SMEs. TPPA: What is in for SMEs? What are the opportunities and challenges for SMEs? How can SMEs get prepared to reap the benefits and overcome the challenges? It is also a platform aimed at increasing understanding and to disseminate in-depth information particularly to the Small and Medium Enterprises (SMEs) on TPPA.